My resistance training journey began one fateful evening, a decade ago, in a crowded high school weight room. My teammates and I, still dripping wet from swim practice, gathered around the athletic trainer as he attempted to explain the intricacies of the barbell high pull. Fancying myself no different from my peers -- despite having been born an above-knee amputee as a result of a congenital birth defect -- I approached the bar and got to work on my first set. It didn’t feel quite right, but nobody said anything, so I figured I was doing okay. I did a couple more sets in a similar fashion and then headed home. Lo and behold, my efforts to mainstream myself had some nasty repercussions. I woke up the next morning with excruciating low back pain and was relegated to the plate-loaded deadlift machine for the rest of the season. It wouldn’t be until eight years later that I would gather the courage to attempt another barbell lift. What went wrong that first day? Likely a bad case of lumbar flexion, in addition to a gross compensatory pattern favoring my intact side. Could it have been avoided? With careful exercise selection and implementation, yes. 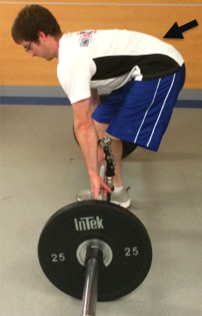 The trouble is, there's a serious lack of strength training info out there for us amputee athletes. As such, I've taken it upon myself to develop a catalog of lower body exercises geared towards the amputee -- as well as anyone looking to develop strength and symmetry in their hamstrings and glutes. And come on, who doesn't want a better backside?! This resource is now complete and available to the masses. It even includes over a dozen short and sweet videos of me performing all the exercises.